Franklin, 9 @ Attleboro, 7 – Final – Franklin’s Even Wendell made a spectacular catch to end the game with the tying run at the plate as the Panthers picked up a win on the road. Wendell (1-for-3, RBI) well full extension in the right-center gap to make the catch and secure the win. Bryan Woelfel earned the win on the mound, scattering eight hits over five innings of work, striking out three. Scott Elliott (2-4, two triples, two runs, two RBI), Alex Haba (2-for-3, triple, run, RBI), Jake Macchi (RBI), Colby Fitzgibbons (2-for-3, two runs) and Jake Noviello (3-for-4, two-run home run) all had strong days offensive for Franklin. Alvaro Espinel (2-4, double, run), Rob Furtado (3-for-4, run), Jon Candiales (2-for-4, triple) and Corey McKenna (2-for-3, run, two RBI) all had multiple hits for Attleboro. Taunton, 4 @ Oliver Ames, 7 – Final – Matt McCormack struck out six and allowed two hits and two runs over five innings of relief to pick up the win for OA. He also went 2-for-3 at the plate with an RBI and a run scored. Mike Friel also went 2-for-3 with a pair of RBI, while Chris Pearsons and C.J. Deveau each had a pair of hits and an RBI. Attleboro, 3 @ Franklin, 1 – Final – Jenna Gittle struck out four and pitched a complete game to pick up the win for the Bombardiers, scattering seven hits. Jackie Cherry had a no-hitter through four innings for Franklin but that was broken up by a MacKenzie Bergdoll (2-for-4) two-out double that brought in Kayla Battisti and Jordyn Lako to put Attleboro ahead 2-1. Gittle brought in Autumn O’Connell with a sac fly in the sixth for an important insurance run. Attleboro coach Mark Homer said both teams “played tight defense” throughout the game. Franklin’s Tara Hartnett knocked in Anna Balkus (2-for-4) in the third for the Panthers’ run. Oliver Ames, 1 @ King Philip, 17 – Final (5 Inn.) – Faith Turnese allowed four hits and just one run in five innings of work for the Warriors, who had 12 hits as a team. Sydney Phillips led the way offensively with three hits, including a double, while Jess Bonner and Elise Pereira each had a pair of hits. One of the hits for Pereira was a grand slam. Lexie Campbell was 2-3 scoring the only run for the Tigers. Caroline Mahoney was 1-2 with an RBI and Katie Mills was 1-2. North Attleboro, 7 @ Hopkinton, 11 – Final – North Attleboro dropped a close game on the road against a good Hopkinton team. Andy DeMattio and Damien Curtis each scored a pair of goals, Tommy Lindstrom had three assists and Jason McNeany (12-for-18 at the face off X) added a goal and an assist. McNeany also added 10 ground balls while Max Fontes had eight for the Rocketeers. Jake McNeany made 15 saves in net for Big Red. Attleboro, 0 @ Franklin, 5 – Final – Franklin moved to 6-0 on the season, sweeping visiting Attleboro. Rohan Herur won 6-0, 6-1 at first singles, Liam Marr notched a 6-0, 6-0 win at second singles and Tyler St. Marie emerged with a 1-6, 7-6 (7-5), 10-7 win at third singles. The team of Tyler DiPalma and Derek Wu didn’t drop a game in a win at first doubles and Tony Calderone and Dan Angermeier picked up a 6-0, 6-1 win at second doubles. Oliver Ames, 0 @ King Philip, 5 – Final – King Philip didn’t lose a game in either singles matches and swept doubles play to beat Oliver Ames. Marco DiStefano (first singles) and Nick Putney (second singles) both won 6-0, 6-0 while Jack Cannon took a win at third singles via forfeit. Jack Mager and Luke Morreale won 6-3, 7-6 (7-3) at first doubles while Andy Cook and Tom Donahue picked up a 6-0, 6-0 win at second doubles. Franklin, 1 @ Attleboro, 4 – Final – Attleboro defended home court against Franklin with two wins in singles play and two more at doubles. Torey Lussier won 6-2, 6-4 at first single and Brianna Arone picked up a 6-4, 6-2 win at second singles for the Bombardiers. Senior Merri Piazza and sophomore Rena Danho won 6-4, 6-7 (3-7), 12-10 at first doubles while sophomores Nicole Matheson and Jill See emerged with a 6-1, 6-3 victory at second doubles. Franklin junior Krissy Stoyonova won 6-2, 6-3 at third singles. King Philip, 4 @ Oliver Ames, 1 – Final – King Philip took all three singles matches in straight sets to earn a win on the road at Oliver Ames. Erin Regnier won 6-0, 6-1 at first singles, Meghan Sepich notched a 6-1, 6-2 victory at second singles, and Caitlin Gonser recorded a 6-4, 6-1 win at third singles. King Philip’s Hannah Putney and Lucy Barnard emerged in three sets (6-3, 5-7, 6-3) to earn the fourth point for the Warriors. Oliver Ames’ Kristin Bloumbas and Emily Yu won 6-1, 6-4 at first doubles. Attleboro, 47 @ Mansfield, 89 – Final – Amanda Mangano won three events for the Hornets, taking first in the 200, long jump, and the high jump. Bryn Anderson set a new personal record in the mile, finishing first in a time of 5:36.9, which was seven seconds faster than her previous best. Alicia Hottleman also set a PR in the 400 and recorded her first win in the event with a time of 66.2. Sophomore Lily Goulding won the javelin and her classmate Julia Miller beat her PR by four seconds to win the 800. Taunton, 3 @ North Quincy, 2 – Final – The Tigers improved to 7-0 on the season with a 25-21, 24-26, 17-25, 26-24, 15-9 come from behind victory. Ricardo DaFonseca led the way for Taunton with 50 assists, four blocks, and a block on the final point that sealed the win. Lens Esquil had 14 kills and seven blocks, Lance Law had 15 kills and Malik Charles had eight kills for the Tigers, while Alex Tavares and Collin Hunter each contributed five kills and two blocks apiece in the win. Sharon @ Attleboro – Postponed to a date and time to be announced. Stoughton, 8 @ Mansfield, 9 – Final – Mansfield scored all nine of its runs in the first three innings and then held off a last inning rally from the visitors to get the win. The Hornets plated three runs in the first, four in the second and two more in the third while Stoughton scored twice in the first, once in the second, twice in the third, and once in the fourth. Stoughton pushed across two more runs in the seventh inning and had the bases loaded but the Hornets escaped the jam for the win. Kevin Dow was 2-for-3 with two RBI and earned the win on the mound in relief, tossing 3.1 innings with two runs allowed and three strikeouts. Colin Gibbons also went 2-for-3 with four RBI and two runs scored while both Max Boen and Aidan Cahill had two hits and two runs scored each. Stoughton’s Justin Hutchinson went 2-for-4 with two RBI and a run while Ruben Gonzalez, Pat Hagerty, Luke Johnson, Evan Gibb and Nick Hardy each had one RBI for the Knights. Taunton @ Milford – Postponed to a date and time to be announced. North Attleboro @ Oliver Ames – Postponed to Tuesday, 4/11 at 3:45. Attleboro, 8 @ Sharon, 0 – Final – Jordyn Lako had two hits and drove in two runs, Julya Woyton went 2-for-3 with an RBI, and freshman Jenna Gittle went 3-for-4 for the Bombardiers, who had 12 hits as a team. On the mound, Gittle allowed only two hits in a complete game shutout. 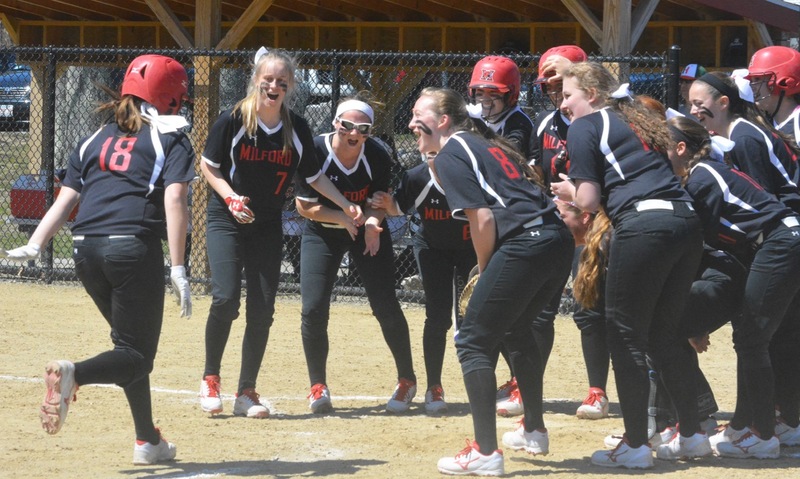 Mansfield, 2 @ Stoughton, 10 – Final – Gina Carafa went the distance in the circle for the Black Knights, scattering 11 hits while striking out 11 Hornets, while also going 2-for-4 at the plate. 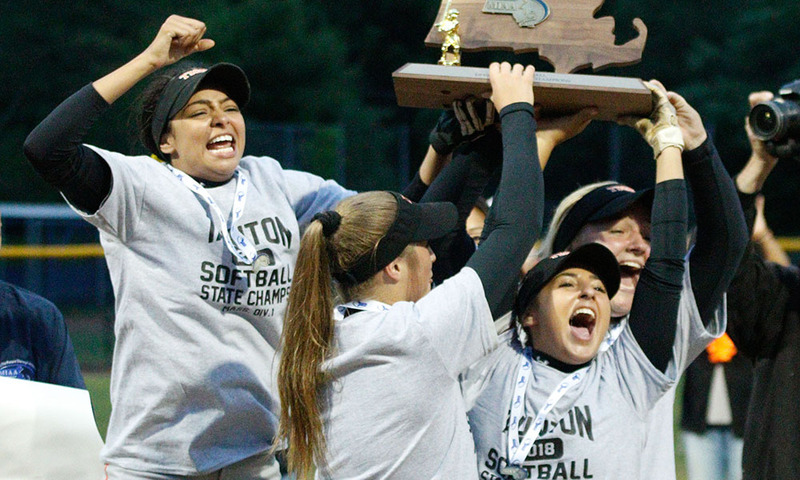 Shannon Flaherty went 3-for-3 with two doubles, scored a pair of runs and drove in two others, Val Whalen had a pair of hits, and Nicki Coppola had three RBI for Stoughton, which scored seven runs in the first inning to take control. Megan Letendre struck out seven for Mansfield and Liz Mackin went 3-for-4 in the loss. 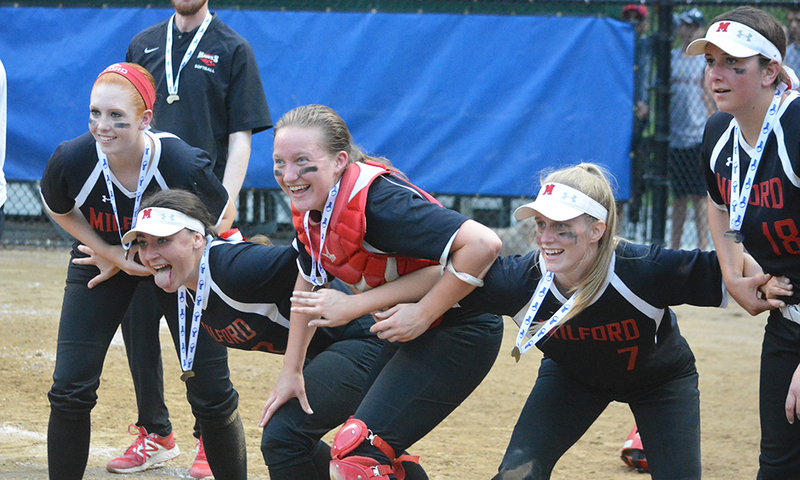 Milford, 1 @ Taunton, 4 – Final – Click here for a recap of this game. Oliver Ames @ North Attleboro – Postponed to Tuesday, 4/11 at 3:45. Stoughton, 1 @ Mansfield, 15 – Final – Nine different players found the back of the net for the Hornets as Mansfield beat Stoughton in the Black Knights’ first ever varsity game. Joe Cox (three goals, one assist), Hunter Ferreira (two goals, three assists), Sam O’Connell (two goals), Aidan Sacco (two goals) and Cullen Murphy (two goals) paced the offense. Haig Megerdichian (assist), Brady Kessler, Josh London and Liam Carey each scored once. Mike Zampine and Mike DuBreuil both had strong games defensively for the Hornets. Stoughton’s David Cellucci scored the program’s first ever goal in the first quarter. Milford, 2 @ Oliver Ames, 13 – Final – Oliver Ames junior attack Eric LeBlanc led the way with four goals for the Tigers, while both junior midfielder Jack Lang and senior midfielder Liam Brown registered a pair of goals. Senior Robbie Almeida, junior Owen Gallagher, sophomores Colin Bourne and Cullen Gallagher and freshman Sam Stevens each scored once for OA. North Attleboro, 12 @ Taunton, 0 – Final – Colin Young, Damien Curtis and Andy DeMattio (assist) all found the back of the net twice as the Rockteers rolled to victory at Aleixo Stadium. Nathan D’Amico, James Young and Nick Ward all scored once and had one assist for North Attleboro. Oliver Ames, 16 @ Milford, 5 – Final – Oliver Ames sophomore Olivia Piazza scored a career-high six goals to pace the Tigers on the road. Junior Emalyn Duvall added a hat trick while juniors Sofia Masciarelli and Chloe Kikelly each registered two goals. OA goalie Ari Waldorf made 13 saves in the cage. North Attleboro, 16 @ Taunton, 7 – Final – Julia Dakin scored three goals and recorded two assists for the Rocketeers. North also got hat tricks from Kenzie Rosenberg and Camille Pizarro and a goal and three assists from Chloe Olsen. Alana Tavares and Bre Conlon each scored a pair of goals for the Tigers and Lorna Li made seven saves in the loss. Attleboro, 0 @ Sharon, 5 – Final – The Eagles didn’t drop a single game at either second singles, third singles or second doubles and took all five matches in straight sets against Attleboro. Senior Griffin Fein won 6-1, 6-0 at first singles while junior Fred Bondar and sophomore Danujan Thirumavalavan won 6-0, 6-0 at second and third singles, respectively. The team of juniors Arie Chinnappan and Ashwin Sreevatsa won 6-1, 6-0 at first doubles and sophomores Max Brody and Russell Rapaport won 6-0, 6-0 at second doubles. Mansfield, 5 @ Stoughton, 0 – Final – Mansfield sophomore Luke Nickerson and senior Gus Daganhardt won in straight sets, with neither dropping a game, at first and second singles, respectively, to lead the Hornets. Junior Ben Salden won 6-2, 6-1 at third singles, the team of Jalaj Singh and Sethu Odayappan won 6-1, 6-1 at first doubles and sophomores Max Bank and Luke Devine won 6-3, 6-3 at second doubles. Oliver Ames, 0 @ North Attleboro, 5 – Final – North Attleboro won all five matches in straight sets, dropping just a combined three games in a win over Oliver Ames. Senior Zac Pfeffer won 6-0, 6-0 at first singles and classmate Barsomo Nuay won by the same score at second singles. Junior Alex Rinaldi won 6-0, 6-1 at third singles while senior Daniel Zhang and junior Ben Pfeffer won 6-1, 6-0 at first doubles and Vikram Senthilakumaran and Mayank Wadekar won 6-1, 6-0 at second doubles. Sharon, 5 @ Attleboro, 0 – Final – Sharon turned in another dominant performance with all three singles matches winning in straight sets without dropping a single game. Nupur Shukla, Emily Zhang and Lulu Yuan won 6-0, 6-0 at first, second and third singles, respectively. The team of Katie Merport and Emily Wen won 6-1, 6-1 at first doubles and Rithika Neti and Sophia Fein won 6-0, 6-0 at second doubles. Stoughton, 0 @ Mansfield, 5 – Final – Mansfield’s Jessica Hanley and Hannah Podolske won a tiebreaker to win at second doubles, completing the clean sweep for the Hornets. Hanley and Podolske won 6-2, 5-7, 1-0 (10-4) at second doubles while Chloe Peters and Tessa Garufi won 6-4, 6-1 at first doubles. Mansfield had strong performances at singles as well as Paulina Martin (first singles) and Sarah Doyle (second singles) both won 6-0, 6-0 and Elizabeth Elsner picked up a 6-1, 6-0 win at third singles. Milford, 0 @ Taunton, 5 – Final – Taunton won in straight sets in all five matches but the Hawks won at least one game in every set except for won. Olivia Sweeney won 6-4, 6-2 at first singles, Jillian Pagliuca won 6-1, 6-3 at second singles and McKenzie Lucie won 6-1, 6-1 at third singles for the Tigers. Emily Moor and Ashleigh Eason won 6-1, 6-0 at first doubles and Carline Hebert and Jordan Martin won 6-1, 6-1 at second doubles. North Attleboro, 4 @ Oliver Ames, 1 – Final – The Rocketeers didn’t lose a single game at first or second singles as well as first doubles in a win on the road at OA. Emily Chiasson and Jordan Willis each won 6-0, 6-0 at first and second singles, respectively, while Katie Demontigny and Hana Hershey won at first doubles by the same score. Azka Siddiq won 6-2, 6-3 at third singles for the Rocketeers. OA freshmen Tate Hadges and Maura Kiernan won 7-5, 1-6, 10-5 at second doubles for the Tigers. Taunton, 3 vs. Greater New Bedford, 1 – Final – Taunton overcame a one-set deficit to pick up a win over previously unbeaten Greater New Bedford Voke Tech. GNBVT entered the match ranked #3 overall in the state by Mass Boys High School Volleyball while the Tigers were ranked #25. The Bears won the first set 25-15 but Taunton rallied to win the next three, 25-16, 25-17, 25-21. Lance Law led the way with a team-high 17 kills and added a block. Lens Esquil had 11 kills and six blocks, Malik Charles added seven kills and a block and Collin Hunter chipped in with six kills and a block.